Cheap Dog Food! Discounts and tricks to grab the best deal! As a first-time dog owner, I really wish someone would have warned me about the hidden costs of dog ownership. I knew full well that vet bills would be expensive, but keeping my dog’s belly full? That came as a huge surprise. Buying dog food isn’t cheap. Each piece of kibble. Each chunk of wet dog food. It’s all paid for with your hard-earned money. Cute as he may be, your dog is oblivious to the fact that he is eating away your money. Or maybe he knows, but just doesn’t care – cheeky thing! But if your furry friend stopped to do some quick doggy math, he would soon realize that his eating habits are quickly adding up. 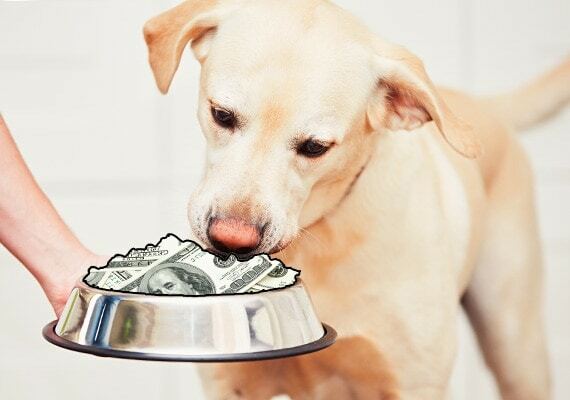 According to Nutrapooch, feeding a medium-sized dog a mid-grade food will cost you around $95 per month. That means you will spend over $1,440 per year on dog food. Next, consider that this is an ongoing cost. The average dog lives for 10 years, so if we take this number and multiply it by 10, you will spend $14,400 on dog food over the course of your dog’s life! And if you have two dogs? Double the food, double the cost. I shudder to think about how much you would spend if you more than two dogs – I’d have to take out a second mortgage! If you are staring at these numbers in disbelief, then don’t worry. I did the exact same thing. While my particular costs are not quite this high, it still surprises me just how much I I spend on dog food. My dog food bill was around $70 a month, bringing my dog food bill to $840 per year. Even more worryingly, this cost is before you consider other doggy essentials such as poop bags and medication. Not to mention the treats I spoil him with. Yikes! 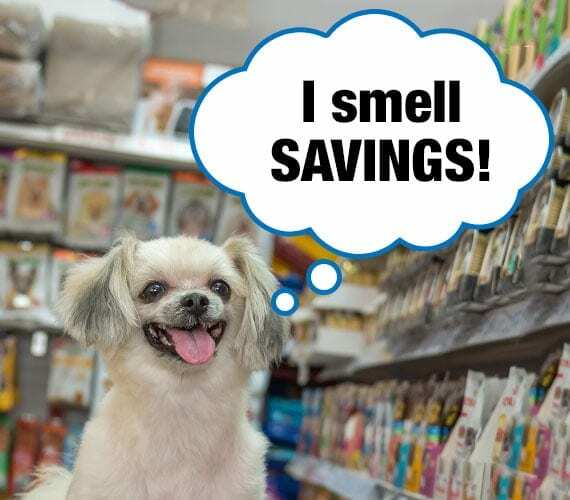 But with frugal practices, like keeping an eye on bargains, using coupon codes and buying in bulk, purchasing dog food doesn’t have to blow your budget. By following these tips, I reduced my monthly bill by $30. That’s an annual savings of $360. What would you do with that money? And best of all, you can do it too! Today, I am going to share my hand-picked dog food deals as well as my secrets to saving big on your dog food bill. For dry dog food, I use the cost-per-pound method. It is often cheaper buying multiple smaller bags of dog food than a single large one. And, calculating the cost based on the price paid per pound allows you to easily compare 6-pound bags to 50-pound bags, and everything in between. Want to know how much you currently pay per pound of dog food? Simply use the calculator below. By entering the total cost of your bag of dog food as well as the weight, you determine the price-per-pound you currently pay for dog food. Write down this number so that you don’t forget it. Use this to compare your current dog food to my deal’s list. If you want the best value for your money, then one of these is the dog food for you. They are cheap and will remain so. 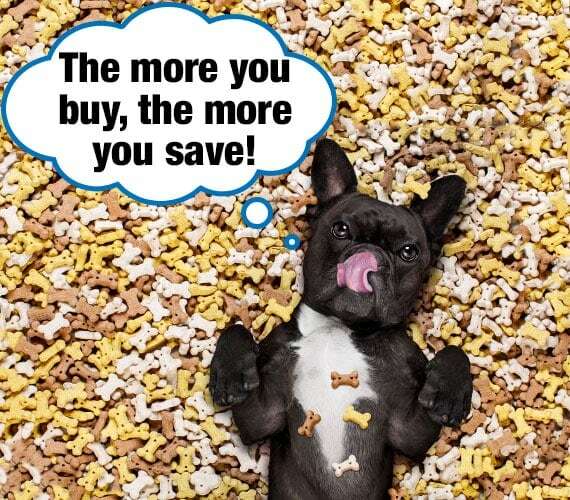 You don’t need coupons, and there are no limited-time offers – just darn affordable dog food. While the price of these selections should remain constant, suppliers can change the price without notice. Don’t worry! I’ll be checking every week to ensure the prices are correct. What if your dog doesn’t like any of the above brands? No biggie. Let’s take a look at other ways you can save money on brand name dog food. Below, I share 13 tips and tricks I use to find the best-value dog food. Let’s kick things off with the easiest way to reduce your dog food expenses – buy a cheaper brand of dog food. If you currently use canned food, consider making the switch to dry food. It is substantially more affordable. But my dog doesn’t like cheaper food, I hear you say. If you tried to make the switch before, then use these handy tricks to convince your dog to gobble down a more affordable meal. 1. Same but different – Buy a similar flavor to your current brand. A familiar taste is more likely to see your dog eat the food. 2. Slow introduction – Slowly add the new brand a little at a time to your dog’s current meal. Gradually increase the ratio each feeding time until your dog is eating nothing but the new brand. Dogs are creatures of habit and often prefer to eat what they have eaten before. 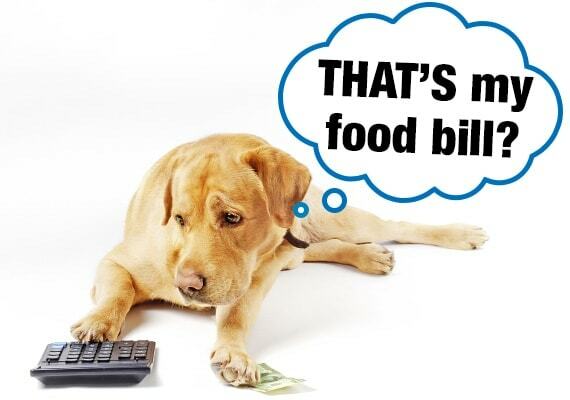 It is for this reason that if you are budget-conscious, start your dog on moderately priced foods from the beginning. If you start your dog on premium brands, he may not willingly switch to low-priced varieties. 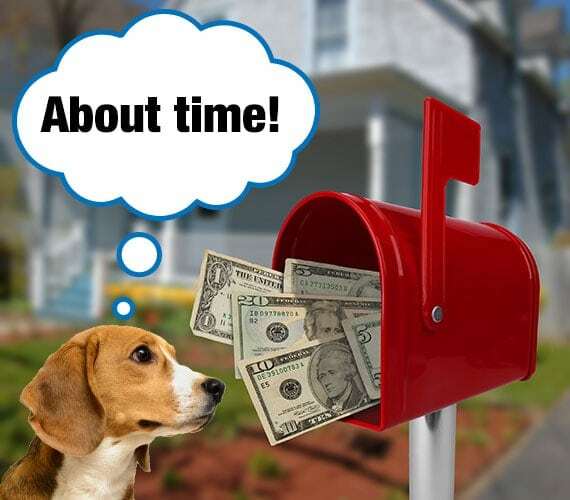 Did you know that dog food manufacturers often send vets samples and coupons? 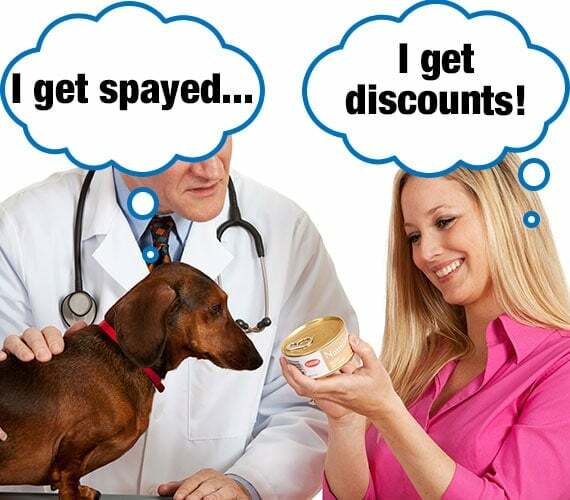 The next time you are at your vet, ask if he has any coupons or samples laying around. You might be surprised by what you are able to score! Does your dog have special dietary requirements? If so, then you want an expert opinion before swapping to cheaper food. Sure, that discounted dog food might look tempting, but if it messes with your dog’s health, then you could end up with vet bills costing a lot more than the savings you made. So, ask your vet if there are any affordable alternatives. Emphasize your financial situation if you need to, stressing that you are at risk of being unable to afford dog food at these prices. You may discover that the only reason he recommended that super-expensive Science Diet is because he assumed you could bear the cost. There is nothing to be ashamed of when asking for cheaper alternatives. Your vet should be happy to help. If your usual vet cannot offer any alternatives, a second opinion never hurts. The bigger the bag of dog food, the better the value, right? This is most people’s line of thinking, and typically, it’s true. However, you might be surprised to learn that for some brands, buying multiple smaller bags of food can be cheaper. Notice anything funny? The 18-pound bag works out to be the most expensive. In fact, it’s $6.91 more expensive than buying three 6-pound bags. If you stick with the larger option and buy 10 bags over the course of a year, you will pay an extra $69.10 for the same amount of food. If your dog’s favorite food comes in different sizes, you might be shocked to learn that there are savings to be had just by swapping over to a different size. Price-per-pound is only a good indicator of value when comparing the same brand and type of dog food. Take a look at the ingredients found in your dog food. You can find this list on the packaging that the dog food came in. Now, what you want to do is compare your brand of dog food to cheaper brands that offer the same flavor. You might find that the difference between the two does not justify the cost. Deboned Salmon, Salmon Meal, Sweet Potatoes, Peas, Potatoes, Whitefish Meal, Natural Flavor, Canola Oil, Deboned Whitefish, Apples, Blueberries, Yeast Culture, Organic Alfalfa, Flaxseed Oil, Potassium Chloride, Salmon Oil, Salt, Minerals (Zinc Amino Acid Complex, Zinc Sulfate, Iron Amino Acid Complex, Manganese Amino Acid Complex, Copper Amino Acid Complex, Potassium Iodide, Cobalt Amino Acid Complex, Sodium Selenite), Vitamins (Vitamin E Supplement, Vitamin A Supplement, Vitamin B12 Supplement, d-Calcium Pantothenate, Vitamin D3 Supplement, Niacin, Riboflavin Supplement, Biotin, Pyridoxine Hydrochloride, Folic Acid, Thiamine Mononitrate), Choline Chloride, Yucca Schidigera Extract, Dried Lactobacillus plantarum Fermentation Product, Dried Lactobacillus casei Fermentation Product, Dried Enterococcus faecium Fermentation Product, Dried Lactobacillus acidophilus Fermentation Product. Well, I should say it used to be his favorite food. At over $60 for a 25-pound bag ($2.40/lb), it certainly doesn’t come cheap. Compare this with his new favorite. At $43 for a 35-pound bag ($1.26/lb), it’s almost half the price! Salmon meal, sweet potatoes, peas, potatoes, canola oil, ocean fish meal, pea protein, potato fiber, natural flavor, flaxseed, salt, choline chloride, dried chicory root, tomatoes, blueberries, raspberries, yucca schidigera extract, dried Lactobacillus acidophilus fermentation product, dried Bifidobacterium animalis fermentation product, dried Lactobacillus reuteri fermentation product, vitamin E supplement, iron proteinate, zinc proteinate, copper proteinate, ferrous sulfate, zinc sulfate, copper sulfate, potassium iodide, thiamine mononitrate (vitamin B1), manganese proteinate, manganous oxide, ascorbic acid, vitamin A supplement, biotin, niacin, calcium pantothenate, manganese sulfate, sodium selenite, pyridoxine hydrochloride (vitamin B6), vitamin B12 supplement, riboflavin (vitamin B2), vitamin D supplement, folic acid. So, why is Merrick’s almost double the cost? Well, there definitely are some advantages. For example, Merrick’s food contains actual chunks of salmon, not just salmon meal. It also contains glucosamine, which may assist with joint health. The way my dog gobbles down his food, he doesn’t seem to notice if there are salmon chunks or not. And as for the glucosamine, my vet said that it’s not particularly important for my young dog. However, if I ever need glucosamine added, I could simply buy glucosamine tablets, like these, separately and still be ahead on cost. For my personal situation, the added cost of these ingredients simply does not justify the added expense. 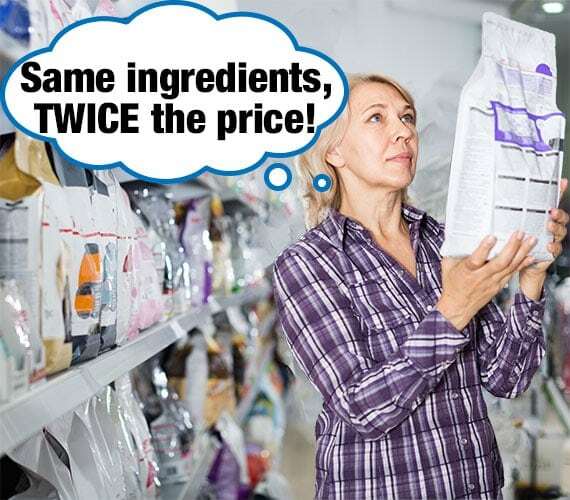 As you see, there is value to be had by checking the ingredients and comparing them to cheaper brands. If, like me, you find that there isn’t a good reason to pay for the premium food, make the swap and save! If you are frugal, then it will come as no surprise that the best dog food deals are often had by shopping around. Sure, your local boutique dog store might shower you with affection, have free sample products for your dog or have a really cool atmosphere, but what’s really important is the price. And, it might surprise you to learn that you can get the exact same brand of dog food you currently buy for a fraction of the price. To illustrate my point, I will price check Taste of the Wild – Venison & Bison (30 lbs), a popular dry dog food that is available from a variety of retailers. That’s a $13.20 difference between the cheapest and most expensive store. Over the course of a year, you could pay over $150 extra for the same product. If you have been overpaying for your dog food all these years, don’t feel bad. 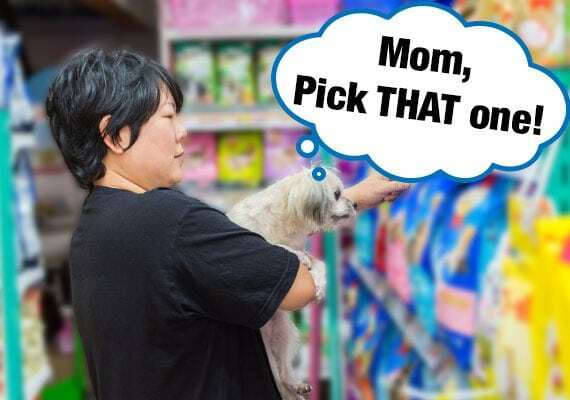 I used to do the same thing – going to the same pet store out of habit. But once you realize the savings to be had, you’ll wonder why you didn’t shop around sooner. Did you just find your dog’s go-to meal at a dirt-cheap price? When PetSmart had a sale on my dog’s favorite canned food, I bought the entire shelf. After returning home and realizing just how much money I saved, I proceeded to hit the other stores in my local area too. I mean, you could buy enough food to cover this month. But if you are going to buy the exact same brand in a month’s time, at a higher price, then it makes sense to buy in bulk. Given that dry dog food generally keeps for a year and canned food keeps for two (unopened, of course! ), there really isn’t a good excuse not to hoard cheap dog food when you stumble across it. Sure, it may be an increased cost upfront, but there are long-term savings to be made. Remember to check the expiration dates. Sure, those 10 bags might seem like a great deal now, but not if the food expires before you feed it to your dog. Now, I’m going to let you in on a little secret that I have used in the past to get cheap bulk dog food. I have successfully done this twice now at two different stores. I simply ask the manager if they will offer me a better price if I buy 10 bags of dog food. In one instance, she reduced the price by $50! It was like buying 8.5 bags of dog food for the price of 10. Bargain! Note: This works best when you speak to someone with the authority to change the price. A store assistant might not be able to haggle with you, so ask to speak to a manager. I also find that this technique works best at local, independent pet stores instead of large retail chains, like PetSmart or Petco. If there is one thing that pet stores love to do, it’s spam your email with weekly ads, flyers and limited-time sales. Some of the deals are pretty darn good – especially if I stock up! Are you cringing at the thought of just how fast your inbox will fill up? Create a new email. One just for your doggy specials. This way you don’t have to worry about pet stores clogging up your inbox with spam. I don’t usually encourage stalking on social media. 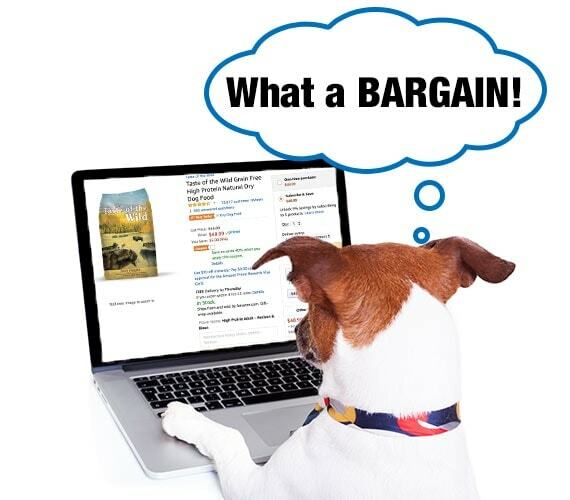 But when it comes to tracking down dog food bargains, I say go for it! Best of all, these brands post pictures of cute puppies in between their discounts. And I think you’ll agree with me when I say… Every social feed could use more pictures of dogs. Everything delivered to my Facebook feed. All I had to do was keep scrolling. Talk about a low-effort way of finding specials and promotions. To get the most out of this, follow as many stores and brands as possible. You will be amazed at how often they offer discounts through social media. Don’t use Facebook? 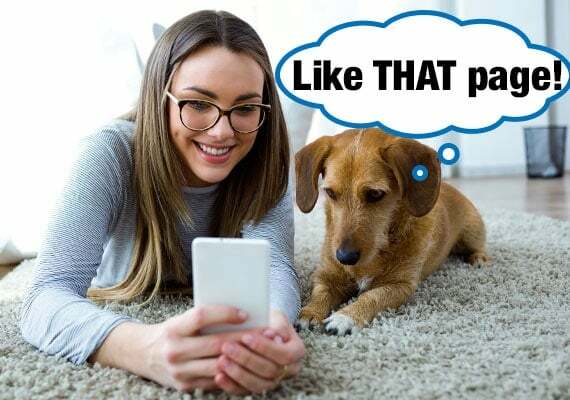 You can also find your favorite dog food store or brand on other social media too, such as Instagram, Snapchat, Twitter and Pinterest. Let’s face it… Once you have your dog’s diet figured out, chances are you are going to be routinely buying the same brands. 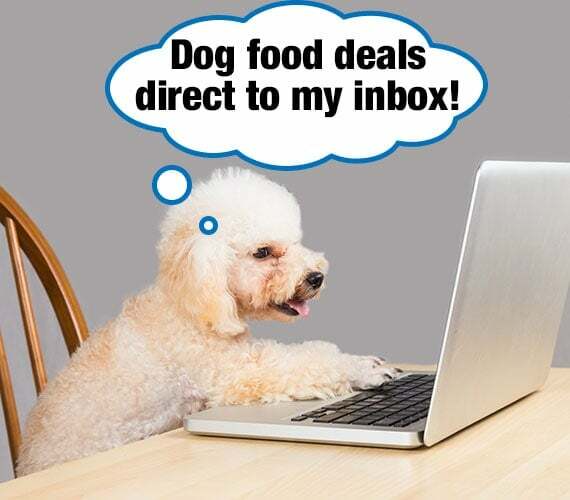 If you find yourself buying the same brands, then why not take advantage of a dog food subscription – many big websites offer further discounts as a reward. Simply place your order, choose a repeating delivery schedule and forget about it. 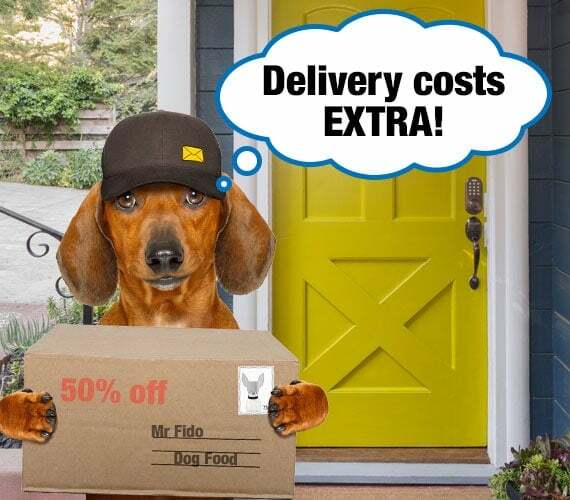 Not only will dog food be delivered directly to your door but also at a reduced price. Here are the most popular dog food subscription services and the discounts they offer. When deciding on a subscription program, it’s always better to go with one that offers a money discount off the price rather than rewards points. Rewards points can only be used at that store. If you buy the largest-sized bags of dog food, then there is an added bonus to online subscriptions – the delivery man does all the heavy lifting. Imagine a 5’2″ person wrestling a 45-pound bag of dried dog food in the Walmart parking lot as passersby have a good laugh. Yeah, that’s pretty much my story. With online delivery, the heavy bag is unloaded at my doorstep where I only have to drag it a short distance to my dog’s food container. If you buy online, don’t forget to factor in the shipping cost. Sure, that 40-pound bag of dog food might seem like a bargain but not if you have to pay an extra $15 to ship it! Some retailers hide the shipping cost, only adding it to your bill during the final stages of check out. Don’t miss it because you are in a hurry! By the time you factor shipping into the cost, you might actually be paying considerably more than if you bought the bag at your local pet store. Fortunately, many retailers and websites offer free shipping. While some never charge, others require you to buy a minimum amount. If buying an extra bag of dog food qualifies for free shipping, then go for it! Note: Do your own calculations. While that shipping cost might not be worthwhile for a single bag of dog food, it might be for three. 11. 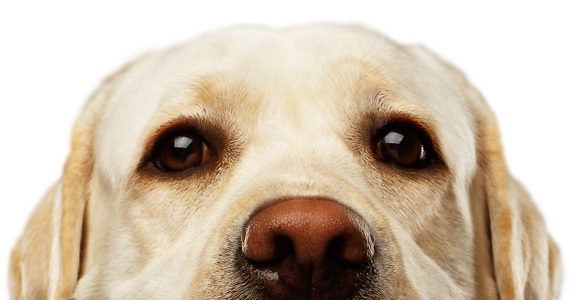 Dog food rebates, buy now and save later! A rebate is a partial refund that is offered after you purchase a product. You are required to provide proof that you actually purchased your dog food, usually by providing a copy of the receipt. Next, fill out your contact details, and in return, you receive a check in the mail with your refund. In the old days, you would mail this to the manufacturer. These days, however, you can claim most rebates online. Hill’s Science Diet is one such dog food brand that loves to offer rebates and offers them regularly. This rebate offers $5 back for every bag of Hill’s Science Diet that you buy in a single purchase. Buy four bags? Get $20 off! In all honesty, I find this to be an awkward way to save money on dog food. Not only do very few brands offer rebates, but it can take months before your rebate arrives in the mail. 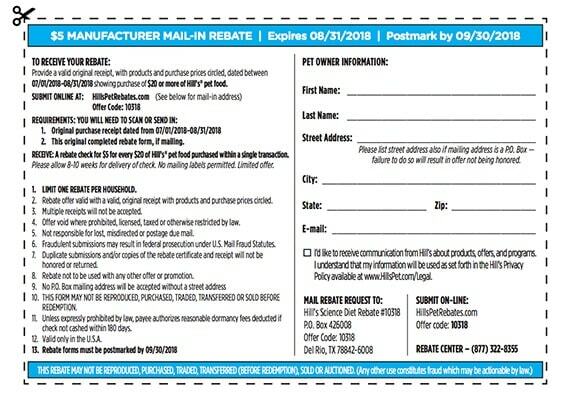 Seriously, the last time I completed a mail-in rebate, it took so long to arrive that I had completely forgotten about it. By the time the check came, I had no idea what it was even for. However, if you are going to buy the brand of dog food that offers rebates anyway, then any money-back offer is a nice bonus. I mean, who doesn’t like receiving surprise money in the mail? I list this toward the bottom because, in my opinion, it’s the most obvious method of getting a discount on dog food. I’m sure you already dig through the brochures and catalogs that clog up your mailbox. It may be time-consuming, leafing through pages upon pages of paper to find that one specific dog food deal. However, if you order online, the process is even easier. Your discount coupon is a quick google search away. All you have to do is search for the website you are shopping at followed by the word coupon. Let’s say you order from Petco. Just before you get to check out, google Petco coupon or Petco promo. The top few websites will specify if there are any deals that you can take advantage of. Finally, you have loyalty rewards. If you shop at a retail chain, it’s impossible to pass the checkout without being asked to sign up for a loyalty program. In my opinion, loyalty programs are dangerous to bargain hunters because they condition you to shop exclusively at a single location. As I covered above, you often find the cheapest dog food if you shop around. 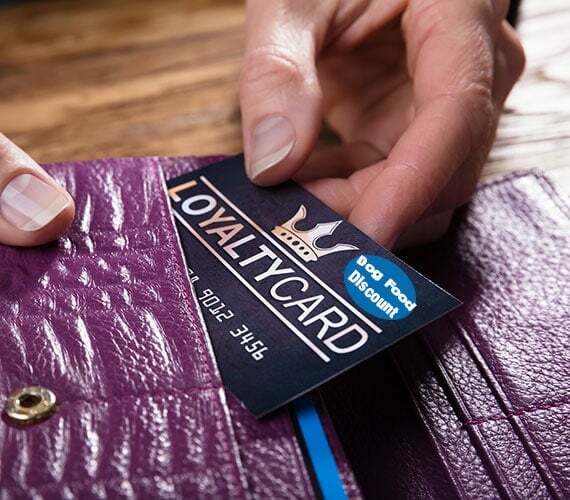 Not only that, but the cost of the loyalty program is factored into the sticker price of each product. To put it simply, loyalty programs often make everything in a store more expensive. With that said, if you plan to shop at a single location, then take advantage of the loyalty program. Petco, for example, gives you $5 to spend on a return visit for every 100 points you accumulate. PetSmart, on the other hand, has a slightly more complicated reward system. In addition to offering similar discounts at checkout, it also offers exclusive specials and even a free surprise on your pet’s birthday. Just like when looking for affordable dog food, if you want to find the most rewarding loyalty program, it pays to shop around. Do you have a secret trick to buying cheap dog food that isn’t listed above? Or maybe you want to share your favorite bargain brand. 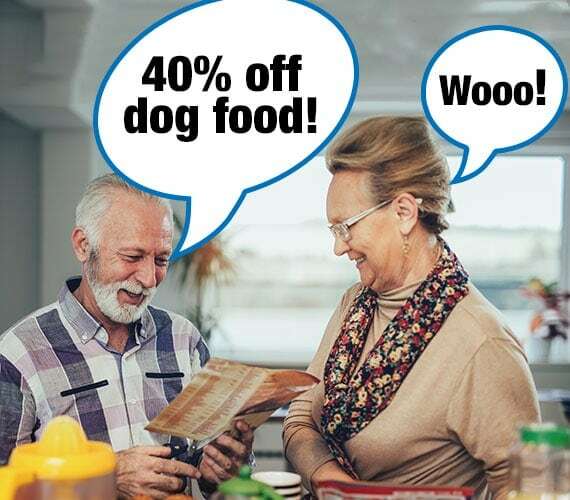 If you come across a dog food deal that is too good to pass up, let me know in the comments below! Content found on doglab.com is for informational purposes only and is not intended to be a substitute for professional veterinarian advice.